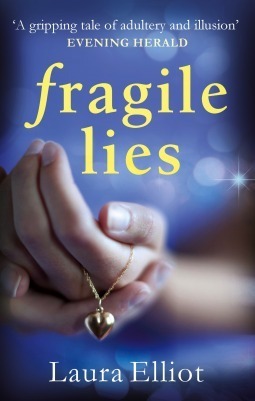 Book Review: Fragile Lies by Laura Elliot. Much thanks to Nergalley and the publisher Bookouture for the review copy. His name is Michael Carmody. He is a writer and a father. His son is lying in a coma, fighting for his life. Her name is Lorraine Cheevers. She is an artist and mother. An illicit affair has destroyed her marriage. Michael is desperate to find the couple who left his son for dead, a victim of a hit and run. Lorraine is desperate to start a new life for her and her daughter. Michael and Lorraine are about to cross paths – damaged souls, drawn to one another. They don’t know that their lives are already connected. They don’t know the web of lies surrounding them. They are each searching for the truth. But when they find it, it could destroy them both. The book had me engrossed from word go. The prologue made for a great start to the book. It gave just enough to get me intrigued and gasping for more. Lorraine Cheevers is an artist who is recovering from her broken marriage. Running away from her former life, she has bought a property in a little village of which she has fond childhood memories. It is her refuge, a place where she hopes she can find peace. Her teenage daughter Emily is certainly not finding her mother’s childhood haven all that enticing. She is upset about being uprooted from her comfortable life. Michael Carmody’s son is in a coma after being in an accident. All he wants is to get his son back and for the people who hit and ran to get tracked down. He can’t understand what kind of people could leave a person to die and drive off. When he does find out, Michael finds that he may have got more than he bargained for. A gripping story of love, betrayal, treacherous secrets and revenge. The characters beautifully etched, some you feel for, you empathize with. others who you detest, all rounded and well detailed characters. Michael’s story had me in tears, it made me wish, hope for a happy ending for him. If I had to chose a character that spoke to me the most, it would be Michael. A book I would definitely recommend. A 4/5 read. An absolute page turner, one that had me engrossed from word go till the very end. What did you think of the cover? I really liked it. It conveyed the emotions of the book very well, thought. Laura Elliot is the author of three novels, Stolen Child and The Prodigal Sister,published by Avon HarperCollins. Her novel, Fragile Lies, will be published in February 2015 by Bookouture. Her books have been widely translated and she has collaborated on a number of high-profile non-fiction books. Aka June Considine, she is an author of twelve books for children and young adults. Her children’s short stories have been broadcast and have appeared in a number of teenage anthologies.She gives regular workshops on creative writing.She has also worked as a freelance journalist and magazine editor but is now engaged full time in creative writing. She lives in Malahide, Co Dublin, Ireland. This book is available for pre-ordering at Amazon(UK). Thank you Netgalley and the publishers for sending me a review copy of this book. Seven year old Indu is living a comfortable carefree life in a small town called Thalassery in Pre-Independence India. The only thing missing in her life is her mother, who died when Indu was a toddler. She lived with her dad and extended family consisting of his unmarried sister, Devi, and nieces Shinnu and Mani. Mani is his elder brother’s daughter, who is a doctor, caught in the Japanese invasion of Singapore. That is family for Indu. Loved and not lacking much. Indu’s life changes drastically when her father, Gopalan is jailed for being a freedom fighter. Gopalan was a lawyer, so his income was good enough for the whole household. Being jailed, everything changes. It falls on to Devi, Gopalan’s sister to manage things to the best of her ability. As a woman of her times, she is clueless about how to go about things, she is after all, proficient at only the things that are expected out of women. All Gopalan had said to his sister was to make she pays Indu and Mani’s school fees. That emphasis on education stays with her. As story progresses, we see her making choices that would have been unthinkable otherwise, especially of the time when this story is set. Her life is different from other women of her times, as is shown by the different circumstances that Shinnu lives under. Her father had not just left her with a legacy of education, but also independence and the encouragement of thinking for herself, of never considering herself inferior because she was a woman. Her father had gifted her with the most precious of gifts, confidence in herself, something that was rare in the women of her era. For me, this book was more about the little cultural (and political) references that added the flavour to the story. Be it the life in Thalassery or Indu’s life in Colombo, it was rich with the flavour of the place, of the time. The food they ate, the circumstances they lived in, and how quickly things changed, especially when the income generator is just one person in a household (that could be true even today, couldn’t it?). The writing did transport me to the place where the narrative was taking place. I could feel Indu’s pride as she defended her father’s role as a freedom fighter , I could feel the desperation of Indians caught in the unrest in Sri Lanka.I could understand Devi’s feeling of helplessness, and clinging to the culture and situations that she is comfortable in. The story itself is just follows Indu’s life but it managed to keep my interest going with all this. Indu’s bond with the various people in her life is really well depicted. Her closeness to cousin Mani, the desolation she feels when Mani’s parents come back to get her. Her own relationship with her Uncle and Aunt, and finally with the man she falls in love with. It could have done with better editing. There some contradictory statements. Initially Indu is shown to have a flair for numbers and asking her father to teach her Maths, further down the line she is shown as opting to do ‘boring Maths’. Devi, Indu’s aunt is called ‘Ammamma’ by Indu and Mani. Ammamma means grandma and it feels a little when they also refer to Devi as ‘Devi’ in conversation among themselves. It just didn’t sit right. Not that it is a huge issue, but just inconsistency that better editing could have easily gotten rid of. An interesting read. A 3.5/5 read for me. Don’t go looking for a twist in the tale but is well worth a read if you like sagas which tell a story of places, and countries along with the protagonist’s life. Anand Nair is from Thalassery, a coastal town in Kerala. Though she has lived in many countries since, she says her instincts are still those of a small-town woman. Now she lives in England but travels to India and Africa frequently. She was trained as a Mathematics teacher and worked in many African countries as a Mathematics Adviser for the British Council. But it is the English language that inspires her. That and memories of the India she left behind decades ago. She believes that the majority of Indian women are disadvantaged because they are women. The urban few have got away but India is 90% villages. She loves gardening and cats. Her second novel Shards of Sunlight, published in January, 2014, is about this old India that is now gone. This book is available on Amazon(UK).